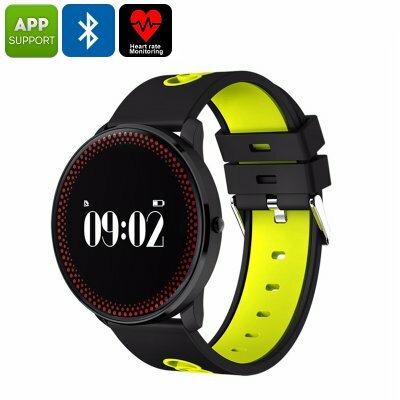 Successfully Added ORDRO CF007 Bluetooth Watch - Blood Pressure, Heart Rate, Pedometer, Calories Burned, App Support, Bluetooth (Yellow) to your Shopping Cart. Work towards a healthier future with the ORDRO CF007 smart bracelet. This Bluetooth watch treats you to a number of high-end fitness features that will guide you through your upcoming workout sessions. It has a stylish design and comfortable fit. Thanks to this, you’ll be able to wear it throughout the day no matter the occasion. With its 80mAh battery in place, it will get you through numerous days of regular usage time without needing to be recharged. Whether you’re simply looking for a stylish watch or a high-end fitness tracker – the ORDRO CF007 is sure to meet your demands. Thanks to its Bluetooth 4.0 support, this fitness tracker bracelet can be easily paired with your iOS or Android phone. Via the dedicated mobile application, you’ll be able to analyze your daily activity levels as well as your sleep performance. Its pedometer keeps accurate track of the number of steps you took throughout the day and informs you on the distance that you have covered. Additionally, your Bluetooth watch also tells you how many calories you have burned during the day. This provides you with easy guidelines to follow to make sure that you’ll meet your daily exercise levels. As a high-end Bluetooth sports watch, the ORDRO CF007 comes with an abundance of advanced fitness features. Hereby you can think for example about a heart rate monitor and blood pressure test. These features provide you with valuable data on which you can adjust the intensity of your upcoming workout sessions. Its sedentary reminder makes sure you’ll never miss out on exercise again and thanks to its sleep monitor, your Bluetooth watch makes sure that you’ll always get the proper amount of sleep. The ORDRO CF007 fitness tracker comes with a 12 months warranty, brought to you by the leader in electronic devices as well as wholesale electronic gadgets..